The Silky Terrier is a true "toy terrier". He is moderately low set, slightly longer than tall, of refined bone structure, but of sufficient substance to suggest the ability to hunt and kill domestic rodents. His coat is silky in texture, parted from the stop to the tail and presents a well groomed but not sculptured appearance. His inquisitive nature and joy of life make him an ideal companion. Size - Shoulder height from 9 to 10 inches. Deviation in either direction is undesirable. Proportion - The body is about one fifth longer than the dog's height at the withers. Substance - Lightly built with strong but rather fine bone. The head is strong, wedge-shaped, and moderately long. Expression piercingly keen, eyes small, dark, almond shaped with dark rims. Light eyes are a serious fault. Ears are small, Vshaped, set high and carried erect without any tendency to flare obliquely off the skull. Skull flat, and not too wide between the ears. The skull is slightly longer than the muzzle. Stop shallow. The nose is black. Teeth strong and well aligned, scissors bite. An undershot or overshot bite is a serious fault. 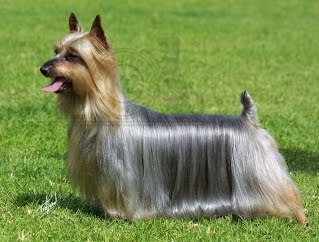 Click Here to Learn about breeder background checks on Silky Terrier breeders if you are looking for Silky Terrier puppies for sale. Click Here to learn how ResearchBreeder.com can help you find healthy Silky Terrier puppies for sale.Silky Terrier puppies for sale. Click Here to order a Breeder or Kennel Background Check on Silky Terrier Breeders that may have Silky Terrier puppies for sale. Click here to find the national breed club for Silky Terrier puppies for sale. Click Here to purchase a list of approved ResearchBreeder.com Silky Terrier Breeders who have Silky Terrier puppies for sale.